Democide is a term revived and redefined by the political scientist R. J. Rummel (1932-2014) as "the murder of any person or people by their government, including genocide, politicide and mass murder". Rummel created the term as an extended concept to include forms of government murder that are not covered by the term genocide, and it has become accepted among other scholars. According to Rummel, democide surpassed war as the leading cause of non-natural death in the 20th century. Rummel defines democide as "the murder of any person or people by a government, including genocide, politicide, and mass murder". For example, government-sponsored killings for political reasons would be considered democide under Rummel's hypothesis. Democide can also include deaths arising from "intentionally or knowingly reckless and depraved disregard for life"; this brings into account many deaths arising through various neglects and abuses, such as forced mass starvation. Rummel explicitly excludes battle deaths in his definition. Capital punishment, actions taken against armed civilians during mob action or riot, and the deaths of noncombatants killed during attacks on military targets so long as the primary target is military, are not considered democide. He has further stated: "I use the civil definition of murder, where someone can be guilty of murder if they are responsible in a reckless and wanton way for the loss of life, as in incarcerating people in camps where they may soon die of malnutrition, unattended disease, and forced labor, or deporting them into wastelands where they may die rapidly from exposure and disease." Democide is the murder of any person or people by their government, including genocide, politicide and mass murder. Democide is not necessarily the elimination of entire cultural groups but rather groups within the country that the government feels need to be eradicated for political reasons and due to claimed future threats. According to Rummel, genocide has three different meanings. The ordinary meaning is murder by government of people due to their national, ethnic, racial or religious group membership. The legal meaning of genocide refers to the international treaty on genocide, the Convention on the Prevention and Punishment of the Crime of Genocide. This also includes nonlethal acts that in the end eliminate or greatly hinder the group. Looking back on history, one can see the different variations of democides that have occurred, but it still consists of acts of killing or mass murder. A generalized meaning of genocide is similar to the ordinary meaning but also includes government killings of political opponents or otherwise intentional murder. 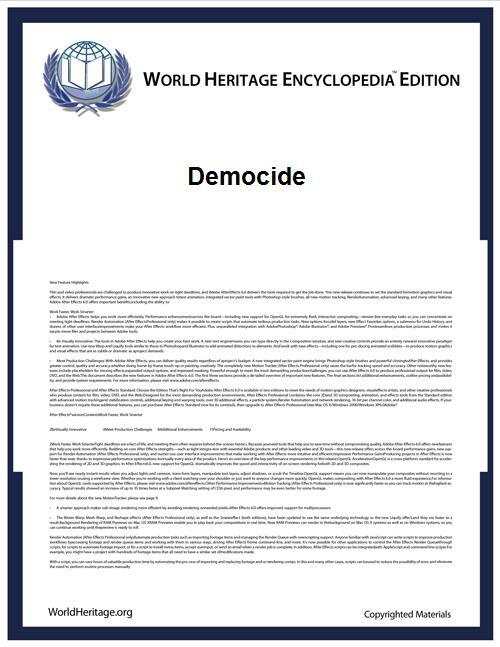 In order to avoid confusion over which meaning is intended, Rummel created the term democide for the third meaning. The objectives a plan of democide include the disintegration of the political and social institutions of culture, language, national feelings, religion, and the economic existence of national groups; the destruction of the personal security, liberty, health, dignity; and even the lives of the individuals belonging to such groups. Some examples of democide cited by Rummel include the Great Purges carried out by Joseph Stalin in the Soviet Union, the deaths from the colonial policy in the Congo Free State, and Mao Zedong's Great Leap Forward, which resulted in a famine killing millions of people. According to Rummel, these were not cases of genocide because those who were killed were not selected on the basis of their race, but were killed in large numbers as a result of government policies. Famine is classified by Rummel as democide if it fits the definition above. For instance, Rummel re-classified Mao Zedong's Great Leap Forward as democide in 2005. He originally believed that Mao's policies were largely responsible for the famine, but that Mao's advisers had mislead him. Therefore, he believed it was not an intentional famine and thus not a democide. However, reports from Jung Chang and Jon Halliday's Mao: the Unknown Story allege that Mao knew about the famine from the beginning but didn't care, and eventually Mao had to be stopped by a meeting of 7,000 top Communist Party members. Based on this new evidence, Rummel now believes the famine was intentional and considers it a democide. Taking this into account, the total for Chinese Communist Party democide is 77 million, more than the Soviet Union (62 million), Nazi Germany (21 million), or any other regime in the 20th century. Rummel's sources include scholarly works, refugee reports, memoirs, biographies, historical analyses, actual exhumed-body counts and records kept by the murderers themselves. He estimates the death-toll for each country over the course of a century, along with a low- and a high-end estimate to account for uncertainty. These high-end estimates might be considered absurd estimates by others. Rummel's counts 43 million deaths due to democide inside and outside the Soviet Union during Stalin's regime. This is much higher than an often quoted figure of 20 million. Rummel has responded that the 20 million estimate is based on a figure from Holodomor that killed 5 million in 1932–1934 is also not included. His research shows that the death toll from democide is far greater than the death toll from war. After studying over 8,000 reports of government-caused deaths, Rummel estimates that there have been 262 million victims of democide in the last century. According to his figures, six times as many people have died from the actions of people working for governments than have died in battle. One of his main findings is that liberal democracies have much less democide than authoritarian regimes. He argues that there is a relation between political power and democide. Political mass murder grows increasingly common as political power becomes unconstrained. At the other end of the scale, where power is diffuse, checked, and balanced, political violence is a rarity. According to Rummel, "The more power a regime has, the more likely people will be killed. This is a major reason for promoting freedom." Rummel concludes that "concentrated political power is the most dangerous thing on earth." Several other researchers have found similar results. "Numerous researchers point out that democratic norms and political structures constrain elite decisions about the use of repression against their citizens whereas autocratic elites are not so constrained. Once in place, democratic institutions — even partial ones — reduce the likelihood of armed conflict and all but eliminate the risk that it will lead to geno/politicide." For books, articles, data, and analyses regarding democide, see Rummel's website. In particular, he has an extensive FAQ. He has also made his many sources and the calculations used, from a pre-publisher manuscript of his book Statistics of Democide, available online. Researchers often give widely different estimates of mass murder. They use different definitions, methodology, and sources. For example, some include battle deaths in their calculations. Matthew White has compiled some of these different estimates. Definition of Democide—by R.J. Rummel, from his book Death by Government.